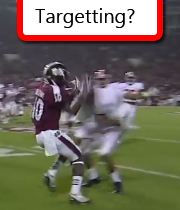 VIDEO: Did Christion Jones “Target?” Comment! I was just wondering this morning how many Bama fans out there thought Christion Jones should have been flagged for 'targeting"MississippiState's Brandon Holloway? • No player shall target and initiate contact vs. opponent with the crown of his helmet. • No player shall target and initiate contact to the head or neck area of a defenseless opponent. I'll have to admit that I think he committed the penalty. There I said it... It is pretty obvious if you watch the video. But with that said... I was glad at the time that he did not get flagged. 🙂 Whether that is wrong, and it probably is, but it is also my human nature (or my Bama fan nature). Like most Bama fans used to hard hitting over the years, it is thrilling to see an opponent laid out by one of our stud players. However, this play needs to serve as a lesson learned to our team. We simply can't afford to lose anyone in the last games of the season to a needless targeting penalty. The next few weeks are critical. We need to play smart and not hit high with the crown of our helmets. Targeting is a controversial rule in college sports because it is often a bang-bang play where two players are traveling at high speeds and contorting their bodies in so many ways. The official have had a real hard time getting it right. the targeting rule in theory is a good one. The players will only play 4 years in college, it is not worth risking permanent brain damage to any of the players on the field. It's a game... that's all. Life is more than a big hit to the head. Did Christion Jones "target?" Read the rules. It's pretty obvious. Yeah, but it did not get called. Watch. I actually disagree with your assessment. Initially I would have agreed with you, but if you watch the sideline angle Jone’s head was clearly across the chest and the shoulder delivered the blow. If there is anything that should be questioned its whether or not he was defenseless by definition. However, in this situation I wouldn’t say he was because it was on a kick and he did not signal for a fair catch and he ran up into the defense. thats a judgement call. at first i thought he led with his shoulder pads which is legal but the refs didnt see that. now after looking at video i think it was a target play. It was a nasty hit. Being a Bama fan Id hate to say yes, but its hard to say. I could see why people would say it was.